Computing information, plain and simple! This script creates a git project to be shared among the users of the Unix group $GIT_GROUP. Every git project will be created into the directory $REPOSITORIES_BASE_DIR. # Base directory where the shared git project are. git init --shared --bare "$PROJECT_NAME"
SSH port forwarding let you connect to a server using another server a relay. For example, if you host a web server in a DMZ behind your office router, you will not be able to access it using its public URL if your workstation is behind the same router. You can easily implement a workaround if you have access to a server on the Internet. Issue this command on one of the machines connected on the same network as your workstation. 192.168.1.50 is the address of the machine that will accept connections from your LAN on port 2080. 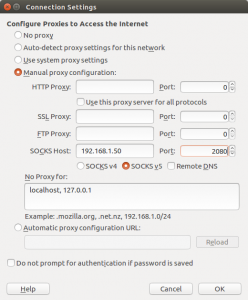 You can use this setup with a browser if you configure it to use a proxy to connect to the Internet. For example, access the proxy configuration of Firefox: preferences >> advanced >> network >> settings. 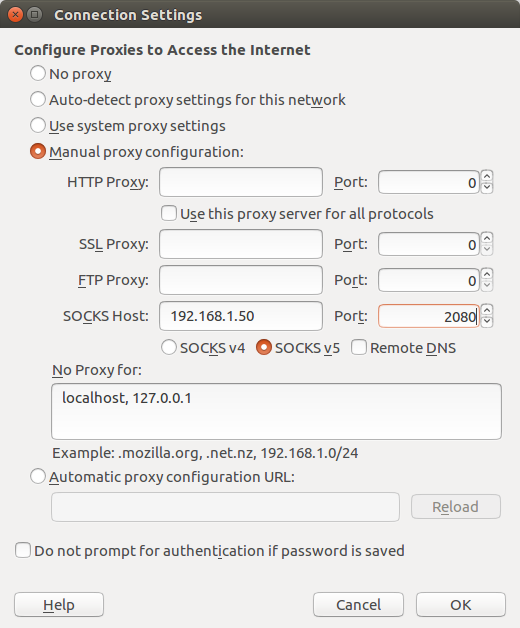 Choose Manual proxy configuration and fill-out the SOCKS host parameters. The result will be that Firefox will open the URLs you type-in using the server example.com. 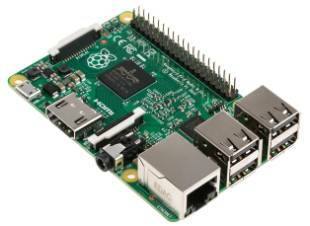 How about a Raspberry PI 2 as a firewall? A Raspberry PI 2 performs as expected exceptionally well as a firewall. The download throughput achieved was 33 Mbits/sec under the same test conditions as the previous test (see Can A Raspberry PI Be Used As A Firewall? for more details). The CPU usage was about 5% during the download test. The CPU usage was around 2% while performing the upload test. These easy steps will improve significantly the security of your Apache2 SSL server. Edit your /etc/apache2/mods-enabled/ssl.conf file and replace the SSLProtocol, SSLCipherSuite and SSLHonorCipherOrder parameters with the following values. After upgrading to Ubuntu 14.04.01, I ran into two issues: One with Apache2 and one with Samba 4.
are now replaced with the Require directive. Detailed information can be found at Apache Module mod_authz_core. Samba has been upgraded from version 3.6.3 to 4.1.6. The “valid users” behavior changed. It works if the user given in the “force user” directive is listed in the “valid users”. For example, datacloud has to be listed in the “valid users”. It creates the home directory if it does not exists. It also copy the stuff of the old user into the new user account. Install the beep utility. Executing beep on the command line will make the internal speaker beep. to listen to IPv4 and IPv6 addresses. This is the default. Alternatively, add one of these to listen only to IPv4 (inet) or IPv6 (inet6) respectively. Setting a static IP address in Ubuntu involves editing /etc/network/interfaces. If the interface is currently using DHCP, you will find these lines in the file. Two files need to be modified to change the name of a network interface in Ubuntu. For example, if you want to change eth0 for lan, simply change the NAME attribute from eth0 to lan in these files and reboot. Do not modify the KERNEL attribute. How to find duplicate files on Linux? It is pretty straight forward in Linux, install fdupes. This script lists all the keys on a memcache server. It is possible to record a terminal session under Linux with ttyrec. It also records vi, emacs, etc. sessions. Setting up a wireless connection via the command line may vary depending on the USB Wireless Interface you are using. These instructions also work for the Raspberry PI running Wheezy. You must be root in order to carry out these instructions. Make sure that your wireless interface is recognized. Find your wireless interface name (usually wlan0). Make sure that your network is visible asssuming the ESSID is broadcasted. Replace wlan0 by you wireless interface name. Prepare your wireless configuration file. It will wait for you to type in your wireless network password. Enter your wireless network password an hit ENTER. Find out which wireless driver you are using. The drivers are listed in the drivers section. The driver you are using is usually labelled “Linux wireless extensions”. The driver name is most of the time wext. Initialize the wireless interface. Make sure you replace wpa.conf, wext and wlan0 with the values related to your environment. Some error messages may be displayed. These errors might not prevent your wireless connection from working. You can check if your wireless interface is properly initialized. Issue this command to get an IP address assuming you are using DHCP. “parted” is a replacement for “fdisk” of Linux. It can handle disks larger than 2 TB. Issue this command to launch “parted” where /dev/sdL is the disk you want to initialize. Create a partition table if it does not exists. For disks larger than 2 TB, you should use the gpt type. You can create such a partition table by issuing this command within “parted”. msdos is the legacy partition table type. To create a new partition, mkpart is used to do so. This parted command creates a primary ext4 partition, starting at the first cylinder to the last sector of the disk. You should align your partitions. You can use the parted command align-check to do so. You can type help to display the list of commands. You can type help followed by a command to display specific help related to this command. How to unmount an encrypted partition?